Hello Reader! Guess What Kung Fu Film Fans? 2 Unreleased Shaw Brothers Films are being released in the U.S. Interested? Click here and Find out the films and release dates. Well Go USA will be releasing 2 more Shaw Brothers films this year. The films are The Shadow Boxing and The Trail of the Broken Blade. To my Knowledge this is the first official release for both films here in the U.S and for me I love Every thing Shaw so my Pre-Order is in. Both Films will be released on December 9, 2014. 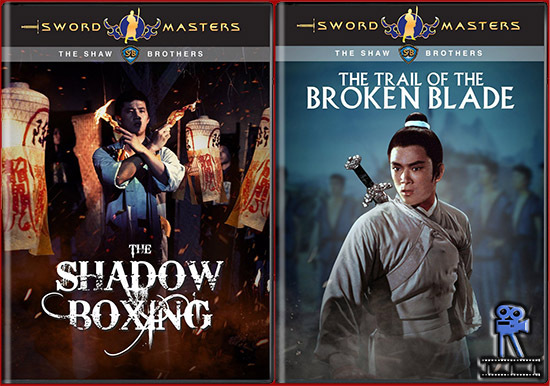 More info on films below along with Pre-Order Links which you must click and pre-order today just because you’re a Shaw Brother fan. Plot: Li Yueh has a secret identity. He is a sword master and heir to the throne, but hunted for executing the man responsible for his father s death. Li s true love refuses to stop searching for him, and the chivalrous bounty hunter she hires to discover his secret soon becomes a loyal brother. But the assassins of Flying Fish Island will not rest until they uncover their prey ultimately forcing Li back to the way of the blade. Plot: Shadow boxer Ku Ting hides his skills behind a regular construction job, but his son can t stay out of trouble, crossing a corrupt boss and a pack of brutal gangsters. When the thugs attack his lady, Ku Ting has no choice but to use the skills he s learned to fight for justice, and his family s safety. 1974 s THE SHADOW BOXER is a legendary entry in the Shaw Brothers catalog, featuring the last performance of real-life shadow boxing champion Chen Wo-fu, whose performance (and death before the film’s release at age 24) drew frequent comparisons to James Dean. To Pre-order just click the titles or photos.